If you looking for nice prints to yourself, your baby, grandchildren, bestfriends, old granny or anyone who you think should have a nice happy print on their walls, you come to the right place. 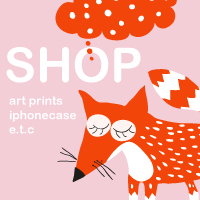 Visit my new shop to see more prints and don´t hesitate with any questions I try to do my best to answer. Have a nice weekend. This entry was posted in Illustration, Painting, shop, work and tagged paintings, posters, shop.prints on 25 November, 2016 by Anna.